We’re on the record as being supporters of Cardi B. Her new album is pretty good! She has a delightful aesthetic, and generally comes across as an engaging and entertaining presence on the pop landscape. Even the annoying attempts to force her into some sort of feud with Nicki Minaj haven’t hurt her profile. Now The Fader reports the Bronx native has laid claim to the record for the most simultaneous tracks on the Hot 100 chart by a woman artist. With the release of Invasion Of Privacy, the rapper now has 13 songs on that list, which is one more than Beyoncé had following Lemonade’s release in 2016. (Drake currently holds the record for most overall songs on the Hot 100, with a jaw-dropping 24 tracks on there in April 2017 during the number-one chart spot of his More Life.) That’s quite a feat, and it’s unclear just what’s driving the massive surge in her record-breaking achievement. Admittedly, perhaps this is just another indicator of a changing pop landscape, one where a new release from a major artist finds audiences routinely placing track after track from a new and mostly streaming release into chart position. That certainly accounts for the presentist nature of the chart records, all of which seem to stem from the past year or two. Or maybe it’s a populist response to a stilted and ossified list, in which listeners surge up to reject the current wave of mainstream “hits” being foisted on them in order to declare their own tastes and preferences in order to force the music industry to adjust to audience opinions. Maybe it’s a coordinated effort by Cardi’s fans. Maybe it’s Russian bots. Maybe it’s Maybelline. 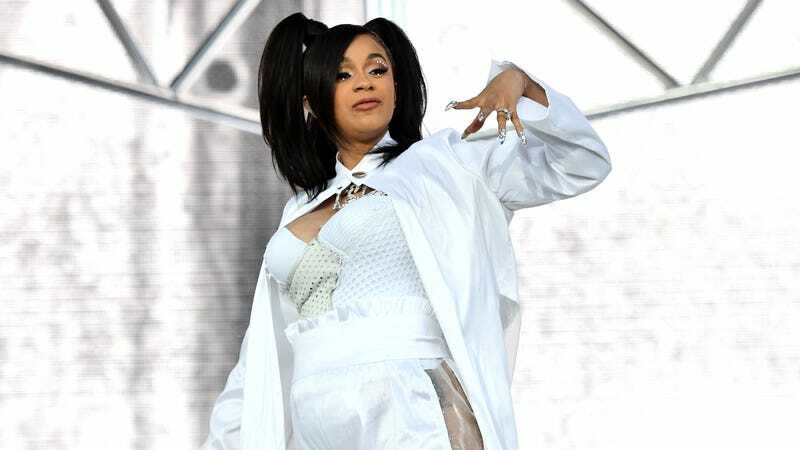 Regardless, we congratulate Cardi B on her newfound success, and look forward to, oh, let’s say seven months from now, when someone else rises to the top of the ever-shifting pop heap. Cardi B goes both soft and hard in her new single, "Be Careful"